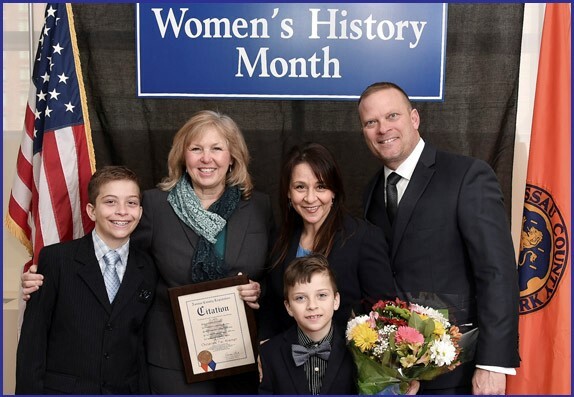 Nassau County Legislator Denise Ford had the privilege of Co-Chairing the 20th Annual Women's History Month celebration at the Nassau County Legislature. As part of the celebration, each Legislator chooses a woman from their district to honor. Legislator Ford chose Christina Tisi-Kramer as an honoree. Christina had an idea of paying it forward and started the Hurricane Harvey donation site which in just 6 days collected enough supplies to fill 5 fifty foot semi-trucks and have them driven to Texas to deliver to a small beach community. Christina and her family recognized that "we too are capable of helping others in times of need". So they established "Waves of Hope USA" and helped the victims of the California Wild Fires delivering 1,000 toys for the 2017 holidays. Thank you Christina, keep on sharing your spirit with us and making a difference in so many lives! Pictured above with Legislator Ford are Honoree Christina Tisi-Kramer, her husband Tim and their two sons.